Darrell was born with hydrocephalus and epilepsy, two neurological conditions that have stunted his development and made it nearly impossible for him to get through the day without a seizure. When Georgia legalized some medical marijuana in 2015, Johns immediately applied for a medical card. 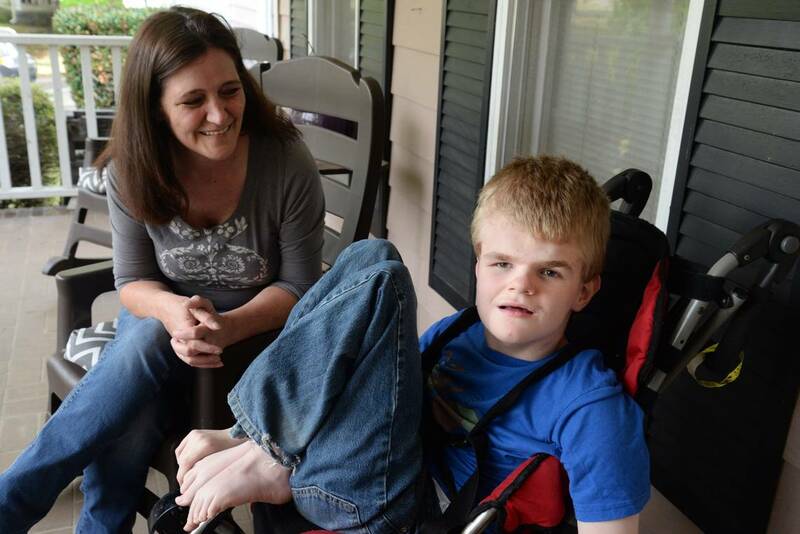 Six days after Darrell’s first dose of the cannabis oil, he said “Mama” for the first time. Johns couldn’t believe it. She cried for three days straight. Darrell went 14 months without a single seizure and cut down from 17 pills a day to just four, in addition to his daily dose of cannabis oil. But even though Johns is legally allowed to possess medical marijuana, she’s had to jump through hoops for the past three years to actually acquire her son’s medication. Georgia is one of the few states where medical marijuana is legal but cultivation and distribution are not. That means the 6,421 Georgia residents with medical cards have virtually no legal way to get the medication they need. “We really have set up a law that is potentially forcing Georgia citizens to break federal law in order to obtain the product,” said state Rep. Allen Peake, a Republican from Macon who spearheaded the 2015 medical marijuana legislation. Georgia’s medical marijuana law is very specific. It permits possession of up to 20 fluid ounces of low THC oil, a liquid extracted from a marijuana plant, which can be used to treat symptoms like nausea, pain and inflammation. Patients suffering from 17 medical conditions, ranging from cancer to post-traumatic stress disorder, qualify for the state’s registry. Once they get approval from their physician, either patients or their guardians can apply for a card, which they can then pick up at their local public health office. After that, card carriers are on their own. The Georgia Department of Public Health does not dispense the low THC oil, nor does it inform card carriers how to obtain it on its website. Patients can’t get medical marijuana in a pharmacy or at their doctor’s office. Peake said Georgia residents looking for medical marijuana have few options. Any oil with a THC concentration of more than .3 percent can’t legally be shipped to another state, so they can’t order it online. They also can’t buy the medical marijuana elsewhere and transport it themselves across state lines without breaking federal drug laws. The only other choice, he said, is to buy marijuana off the street and make the oil from scratch, which is both illegal and medically risky, since consumers have no way of knowing the THC level in the product they’re buying. Peake decided to offer an alternative. He’s created what he calls an “underground network” to bring the medication in from out of state. Registered Georgia residents from across the state can come to Peake’s Macon office to pick up their medication, free of charge. It’s not a perfect solution, but it’s the best Peake can offer, for now. Peake said he receives messages from Georgia residents every day, asking him for help. He’s provided over 700 families with at least one two-ounce bottle of low THC oil, and his waiting list is 120 days long. So many people have contacted Peake that, in the past two months, he’s started turning them away, unless they’re terminally ill or have a child. But Peake said his current operation won’t be sustainable in the long term. Jason Cranford has been studying medical marijuana for years. He’s the founder of Flowering Hope Foundation, a nonprofit that educates consumers and doctors on the health benefits of medical cannabis. Most medical school curricula leave out units on cannabinoids and the biological systems that make medical marijuana effective, Cranford said. Some doctors are reluctant to even talk about medical cannabis. But most, he said, want to learn more. Research suggests that opioid use often goes down when states legalize medical cannabis. Another study found that Medicare filled fewer prescriptions for drugs that could be treated by cannabis when states passed medical marijuana laws. Unlike opiates and other prescription drugs, Cranford said, medical cannabis is not toxic nor does it seem to be addictive. More research needs to be done, Cranford said, and he’s working on several papers that investigate the body’s response to cannabis. But there’s no doubt in his mind that medical marijuana can be effective. Cranford helped to draft Georgia’s medical marijuana laws, and he called the current policy “comprehensive” and “well-written.” But he said there are two missing pieces: cultivation and distribution. The state already is taking steps toward expanding its medical marijuana policy. The Georgia legislature convened a new commission this summer to study possible changes to the law. Both candidates for governor — Stacey Abrams and Secretary of State Brian Kemp — have discussed potential reforms and have pledged to heed the advice of the commission. Peake hopes that whichever candidate becomes governor will stay true to his or her word and follow the commission’s recommendations. Peake has chosen not to run for reelection this November, but he feels confident his colleagues will continue to push for a solution to the state’s medical cannabis dilemma. Commission co-chairmen Rep. Micah Gravley, a Republican from Douglasville, and Sen. Matt Brass, a Republican from Newnan, are passionate about the issue, Peake said, and he thinks they’ll propose a more practical way for Georgia residents to access THC oil. Changes to medical marijuana law won’t come without pushback, though. Advocates for reform have faced resistance from law enforcement agencies and faith-based organizations, which argue that more access could lead the state down a slippery slope toward recreational drug use. But Peake thinks most of his colleagues are ready to take the leap. Once they hear the stories of Georgians in need, he said, they’ll support increased access. It wasn’t until Peake met a little girl suffering from seizures, Haleigh Cox, that he decided to author Georgia’s medical marijuana bill, named the Haleigh’s Hope Act in her honor. Leslie Johns wouldn’t be able to get her son’s medication without Peake’s help. When Georgia first legalized medical marijuana, she had to leave the state to get THC oil and bring it back across state lines. Her husband was terrified. Now, Johns drives across town every few weeks to pick up Darrell’s medicine at Peake’s office. Medical cannabis has changed her life. Darrell can communicate with his mom in ways he couldn’t before. He roams around the house and spends hours tapping out rhythms on pots and pans. And he hasn’t had a seizure in 72 days. Johns knows that her son’s life will never be normal, but with medical marijuana, she said it’s about as normal as it can be. She only wishes it wasn’t so hard to get. “I just want him to be happy and healthy,” Johns said.